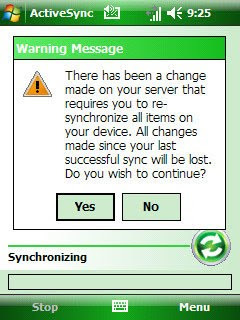 About once a month, I get this Warning Message when syncing my Windows Mobile phone to my computer. When this happens, I have to select Yes in order to synchronize the data on my phone and PC. And when I tap Yes, I lose any changes made to data on the phone since my last sync. Plus, I lose all my phone speed dial settings. Additionally, ActiveSync is flaky enough that sometimes selecting yes means I have no address book on my phone for a few days while ActiveSync repeatedly fails to put the data back on the phone.